iPad 5th generation keyboard case – what have I done? I did something pretty stupid on Sunday. I needed a case for my new iPad 5th generation (not pro) and I was sort of interested in a keyboard case. The new iPad doesn’t support the Apple Smart Keyboard. I knew there were several out there, including the Logicool Slim Folio made just for this iPad. On Saturday, on the way back from Dave’s birthday party I went case hunting at Yodobashi Camera in Akibara. I almost bought a Sanwa soft back protector case (really all I need). But it seemed expensive at ¥2,800 just for that. Then I thought, well maybe I should have the Apple Smart Cover along with that. That’s like ¥4,400 yen. So the total seemed sort of boring and a waste. But I had a Yodobashi gift coupon burning a hole in my wallet from when I got my iPhone 7 Plus in November and wanted to get something. I asked about keyboard cases for this iPad, and the salesman took me to that corner, but the ones for the iPad 5th generation hadn’t come out yet. So I decided not to get anything and went home. On Sunday, during Hibikinokai lunch hour I went over to the Yodobashi Camera in Hachioji, right next door. The Logicool had just come out that day! I felt it and tried it and impulse purchased it. So I let myself stew about it for a day and then took it out of the box again a while ago, and I’ve been playing with it. I don’t know if I’ll use it all the time, but it is actually quite cool! I’m tying this message on the iPad right now, at the same speed I would on my MBP. That in itself is cool. There is also a whole row of keys at the top just made for iOS – jump to home, Siri, search, switch languages, bring up the keyboard, music controls, sound controls, lock the iPad and more. You can double-tap the home key to bring up the multi-tasking menu to switch back and forth between apps. Also, unless you want to raise the iPad onscreen keyboard, it replaces it by default, so you save a lot of screen space that would otherwise be devoted to the keyboard. There are extra Mac-like editing keys, like up-down, left-right arrows. I guess because this one is sold in Japan, Option-Y even switches to the ¥ sign, even when in English mode. Because of these extra keys, editing is much easier than just in tablet mode. Technologically speaking, it is rather cool. And since I got the wi-fi plus cellular model iPad it’s like having a truly portable computer with you with an overall weight half that of my MBP. And of course you can use the tablet on-screen features to tap and do all the normal things you do. The keyboard comes with some small coin-sized batteries that are supposed to last 4 year before needing changing. And the Bluetooth connectivity was trivially easy. So I’m somewhat won over by it. I might not use it all the time, but I’m tempted to try bringing it, instead of my MBP, to the next Hibikinokai meeting and doing my lectures from it. 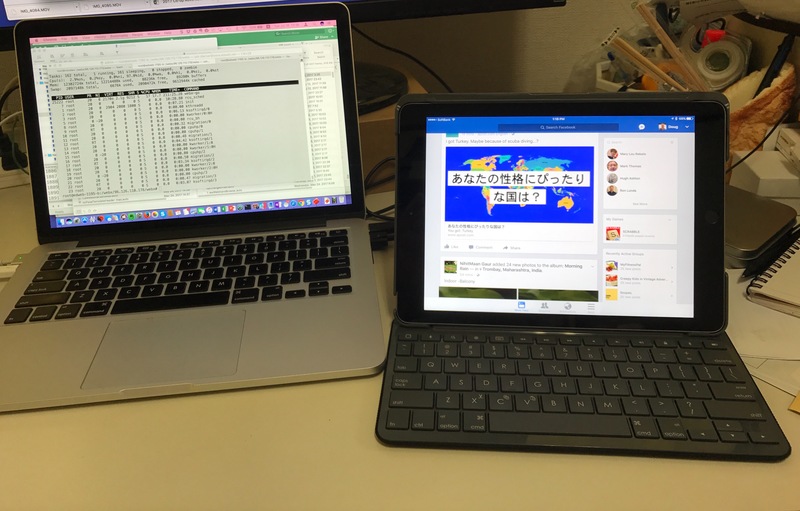 The photo shows my MBP on the left and my iPad 5th Generation with keyboard case on the right.